Heads up! This notice is about tomorrow, May 1. Optimist International Elections - Optimist Clubs that are current in their club financial obligations are invited to vote for the Optimist International President-elect, Regional Vice President-elect, and two candidates for the International Board of Directors. There are five candidates running for two positions on the Board, the only contested races. The Optimist Club president will receive their voting credentials from Survey Ballot Systems (SBS) on behalf of Optimist International. The voting must take place on or before May 31, 2018. Find out about the candidates here. Optimists in Action Month - The month of May has long been Optimists in Action month; however, this year it is being promoted especially well. Share pictures of what your Optimist Club is doing in your community on Facebook, Twitter, and through your club bulletin and other print media. Please share your stories here. 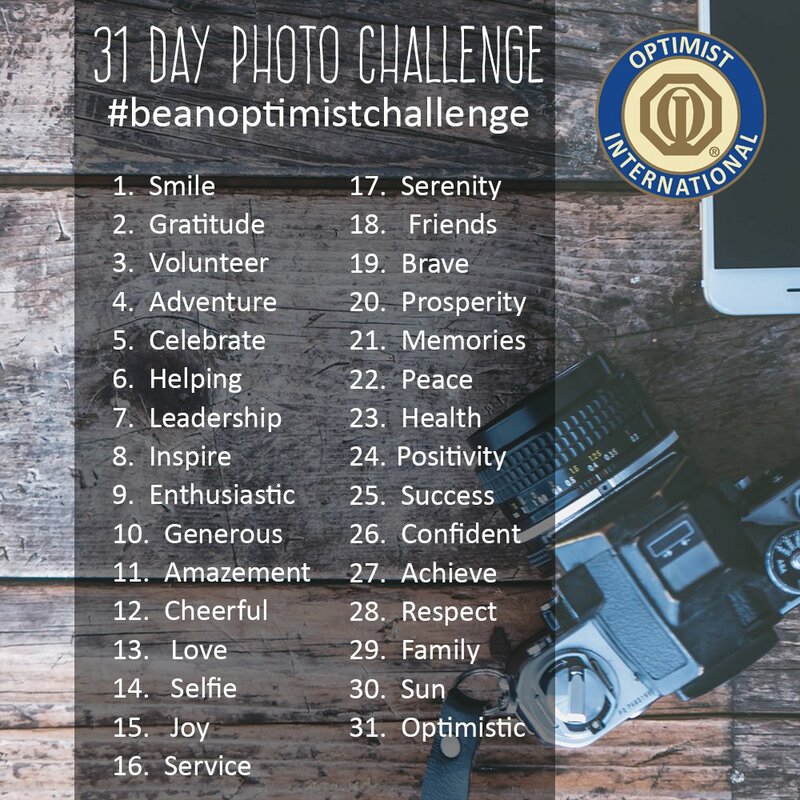 For the first time, Optimist International is hosting the #beanoptimistchallenge on Twitter and Facebook to encourage the sharing of photos, especially for those clubs that aren't hosting events in May. Using the 31 prompts shown here, share a photo of an Optimist activity on your favorite social media platform. Optimist Club Officer Elections and Reporting - As always, the club officer election report (COER) is due by May 20. Please login to optimistleaders.org and report your club officers so that Optimist International and the District may begin to communicate with the future leaders of the club. This is a requirement for Honor Club. Being an Optimist Club member is an invitation to serve your community. May you serve with a positive outlook in the month of May, and throughout the year. Optimist Club fundraisers come in many forms and many involve food and drink, including pancake breakfasts, spaghetti feeds, and more. Such programs usually find the Optimist Club members planning the event, selling tickets, cooking, and cleaning, as they meet with members of the community to share their optimism. Food events can be very labor intensive! However, two Optimist Clubs are holding fundraisers in the coming week that involve hospitality without so much work. They rely on marketing - largely word-of-mouth - to make them successful. The first event is sponsored by the West Tacoma Optimist Club. It is a takeover fundraiser where the Optimist Club receives money from all food consumed at Joeseppi's Italian Ristorante, Sunday, April 29, 2018, 4:00 - 8:00 p.m. There is also a silent auction. Joeseppi's Ristorante is at 2207 N. Pearl Street, Tacoma, Washington. The second event is sponsored by the Oregon City Optimist Club. 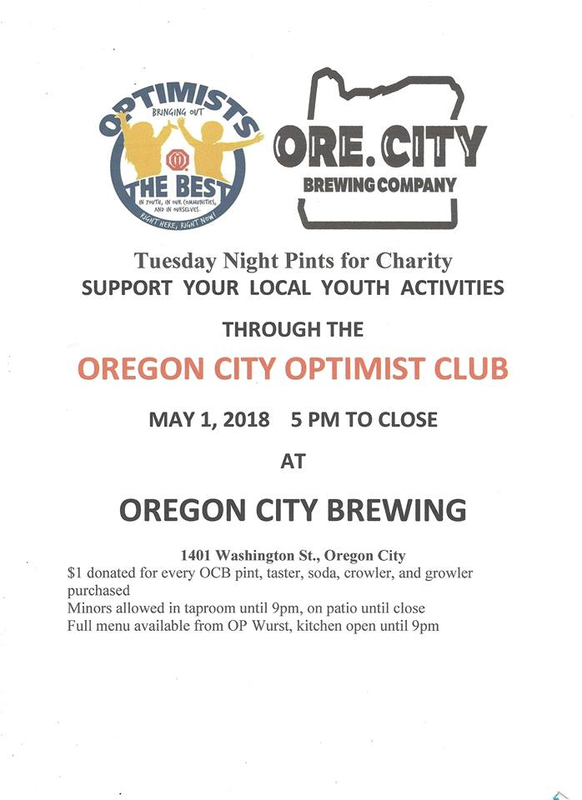 It is Tuesday Night Pints for Charity at Oregon City Brewing Company, May 1, 2018, 5:00 pm to close. 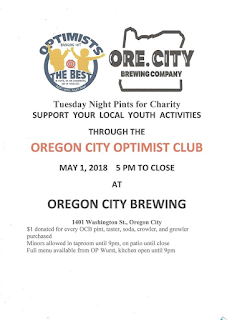 $1 will be donated to the Oregon City Optimist Club Youth Activities for each purchase made of OCB products. The Oregon City Brewing Compay is at 1401 Washington Street, Oregon City, Oregon. Please join the clubs as they raise money for their youth activities and help them out by sharing this post with your friends. Thank you! Governor-elect Ben DeRemer has spent the better part of two months visiting Optimist Clubs in the PNW District-Optimist International. 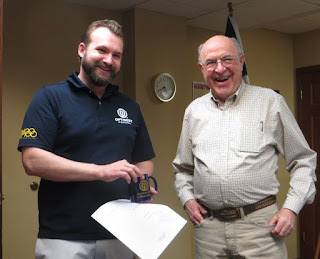 He's shown here with Roger Davidson, President-of-Record, West Tacoma Optimist Club. Ben has been to Idaho, Washington, and British Columbia, and will soon, if he hasn't already, return to his home state of Oregon for the final series of visits. The purpose of the visits is to get to know the Optimist Clubs better, including people and projects. In addition, he has recently sent surveys to all club presidents and secretary-treasurers in an effort to crowd-source information that will help the district write a strategic plan. Ben understands there are challenges facing Optimist Clubs, like all service clubs, and he has reached out to the PNW Kiwanis District for insight. He's also sharing information that he gathers with Harvard professor and author Robert D. Putnam, known for Bowling Alone: The Collapse and Revival of American Community. When Ben takes office October 1, 2018, he will be the youngest governor to ever serve the PNW District, and perhaps, with the analysis he is performing, the most strategic. I hope all clubs will join me as we look forward with optimism to a year of growth. Membership retention and recruitment tip #56: Offer a reward. Sitting at a stoplight, I saw a sign on the car wash next to me that read, “Join the club.” With a smile on my face, I thought, don’t they know that it’s hard to get people to join a club? Then I thought, no wonder people don’t want to join a club, they are confused about what it means to join one. A car wash club is a purchase, whereas a service club means joining with other people for fellowship and volunteer opportunities. And then as a last thought, I wondered, what does this car wash know about membership that I don’t know? The answer was actually pretty clear: As a member of the car wash club, you could wash your car every day for $1 per day, at multiple locations, hassle-free, with no contracts and automatic billing to make the transaction super-simple. The car wash club member was rewarded with a clean car and savings for their loyalty. What can an Optimist Club learn from this example? People are not afraid to make to make a commitment, they just need to see the reward. It can be difficult to explain that fellowship is the reward for joining an Optimist Club. Perhaps instead we should offer something tangible like a club shirt or a free online listing for a member's business. The reward should relate to the image of the club in the community and help the new or veteran member and the Optimist Club to be recognized a positive force for good. Reward your members and they'll continue their investment in your club. For Optimist Clubs, the Spring season brings Easter egg hunts, scholarship contests, youth appreciation activities, and so much more, including junior golf. 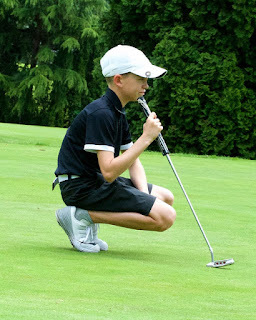 The PNW District-Optimist International is fortunate to have two separate qualifying tournaments for the Optimist International Junior Golf Championships, one in Canada and one in the US. The first takes place this month, April 22, 2018, at King's Link Golf Course, Ladner, British Columbia. Coordinated with the help of the Vancouver, BC Optimist Club, it is part of the Junior Linkster Tour, and non-members are welcome to participate. Tour members registration fee is $75 and non-members fee is $85.00. For more information, contact Mike Riske. In the US, the Hillsboro, Oregon Optimist Club organizes the qualifying tournament. It will be held May 19, Forest Hills Golf Course, Cornelius, Oregon. The registration fee is $50. More information is available from tournament director Al Young. Both tournaments welcome boys and girls in the following divisions: Boys 10-11, 12-13, 14-15, 16-18; and Girls 10-12, 13-14, 15-18. In order to be eligible, the golfer must not turn 19 on or before August 1, 2018. Any golfer who has attended college is no longer considered a junior golfer and is not eligible to participate. There are a limited number of golfers in each division who will advance to the international championships provided they shoot the minimum qualifying score. Financial support to attend the Optimist International Junior Golf Championships will be advised by the tournament director. The Optimist International Junior Golf Championships will take place July 17-August 1, 2018, PGA National Resort and Spa, Palm Beach Gardens, US. Find out all about THE OPTIMIST, with more than 600 international junior golfers competing each year. This is a short post, with an even shorter video, that shows off just one of the many different things that an Optimist Club might do. The Hillsboro Optimist Club volunteers as support and security for several different events in their hometown. They monitor the Tuesday and Saturday Markets to be certain people aren't walking away with open bottles, among other things, and they provide crowd control at many local parades. At the most recent parade on St. Patrick's Day, they augmented their support with a Monster Truck display. Decked out in green, the video shows the trucks with the Hillsboro Optimist Club banners proudly leading the way. Thanks to Jack Thornton for the photos. March 31 marked the midpoint of the Optimist Club and Optimist International administrative year. It's a good time to track your Optimist Club's progress toward being an Honor Club. Each year, Optimist Club presidents set out to make a difference in their club and community by producing the best programs and conducting the best projects. To do so requires people, money, creativity, and passion. To do so well also requires some administrative duties. For as long as I can remember, and that's over thirty years now, Optimist Clubs have been working their way to Honor Club as a way to memorialize their annual achievements. When an Optimist Club earns the Honor Club recognition, it meets all the criteria of being relevant and enduring in its community and we have hope that its work will continue on for many years to come. 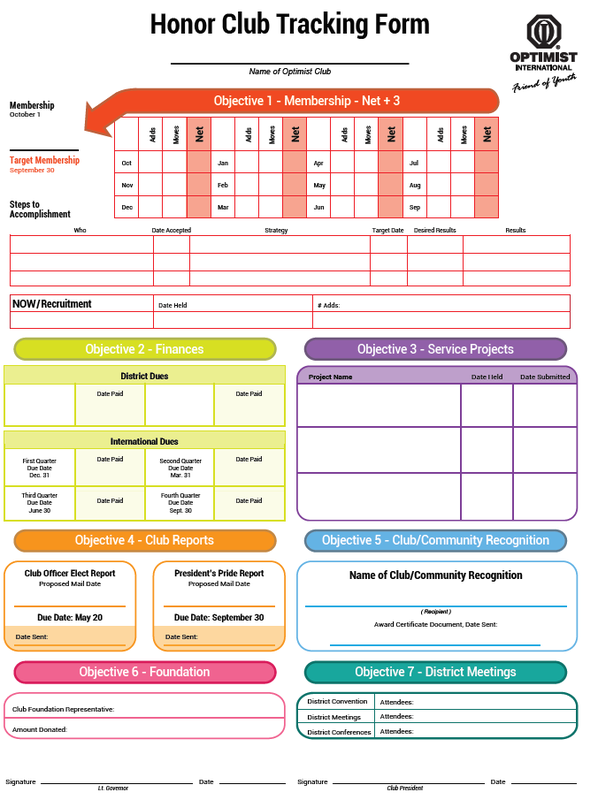 Please click on the picture to enlarge and download and monitor your Optimist Club's path to success. Please do your part to make certain that your Optimist Club is an Honor Club. There are still six months to make it happen!